Ghobadi, N., Saberi Moghadam, A. (2010). Production of Metalized UDMH Gel Fuel and Study the Effect of Surfactant on the Homogeneity and Stability of the Aluminium Nano Particles. International Journal of Nanoscience and Nanotechnology, 6(1), 65-70. N. Ghobadi; A. Saberi Moghadam. "Production of Metalized UDMH Gel Fuel and Study the Effect of Surfactant on the Homogeneity and Stability of the Aluminium Nano Particles". 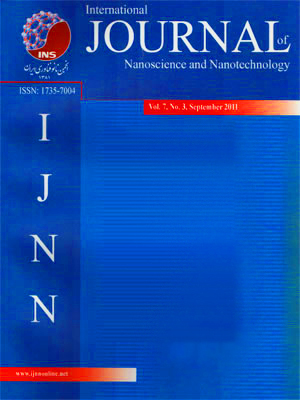 International Journal of Nanoscience and Nanotechnology, 6, 1, 2010, 65-70. Ghobadi, N., Saberi Moghadam, A. (2010). 'Production of Metalized UDMH Gel Fuel and Study the Effect of Surfactant on the Homogeneity and Stability of the Aluminium Nano Particles', International Journal of Nanoscience and Nanotechnology, 6(1), pp. 65-70. Ghobadi, N., Saberi Moghadam, A. Production of Metalized UDMH Gel Fuel and Study the Effect of Surfactant on the Homogeneity and Stability of the Aluminium Nano Particles. International Journal of Nanoscience and Nanotechnology, 2010; 6(1): 65-70. Gelled propellants are improved propellants that can be considered as the final extension of liquid propellants. High specific impulse, good density and safety better than that of both solid and liquid propellants are advantages of the gel propellants. They are made by addition a suitable gellant to liquid propellants. In this research, nano Al particles have been used in UDMH gel fuel. The gellation process was done in two steps. First, making metalized nano suspension using ultrasonic-magnetic agitation and second, gellation under mechanical-magnetic agitation. Tween-80 as a surfactant was added to the fuel to distribute nano Al particles in the gel media. Experimental study showed that, adding 3% Tween-80 to the gel mixture caused better distribution of nano particles in gel and improved homogeneity, stability and decreasing synersis of the liquid fuel, UDMH, from network of the gel.